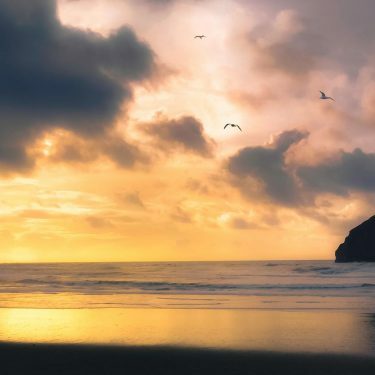 Planning a family vacation to the picturesque Oregon coast? 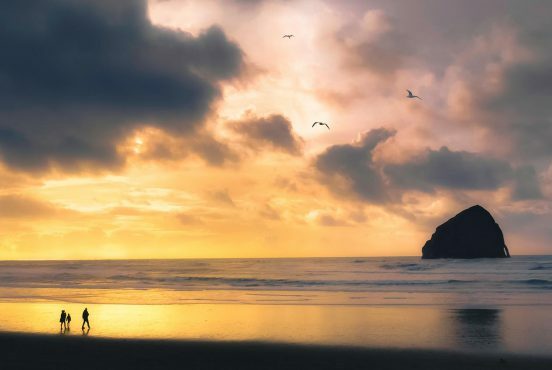 Whether you’re an outdoor enthusiast heading for the Oregon Coast Trail or a sightseer in search of panoramic vistas, the Oregon coast is a fantastic vacation destination for all. Fresh seafood? Check. Epic beaches? Check. Tide pools and aquariums for curious kids? Check, check. The sights, trails, and beaches are free to visit (minus the occasional parking fee), but finding a place to stay near the beach can get a little pricey. Of course, that’s a challenge with any beach town — not just the Oregon coast. 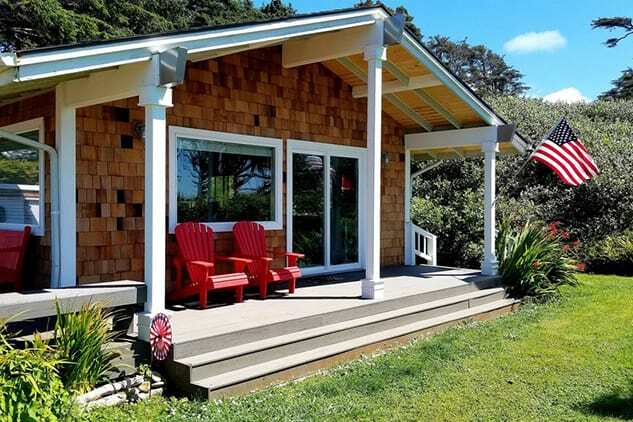 Fortunately, the Oregon coast offers plenty of vacation rentals that fit every budget. No matter how much you’re looking to spend on your vacation, you’ll find an option here that’s affordable, high quality, and perfect for you. 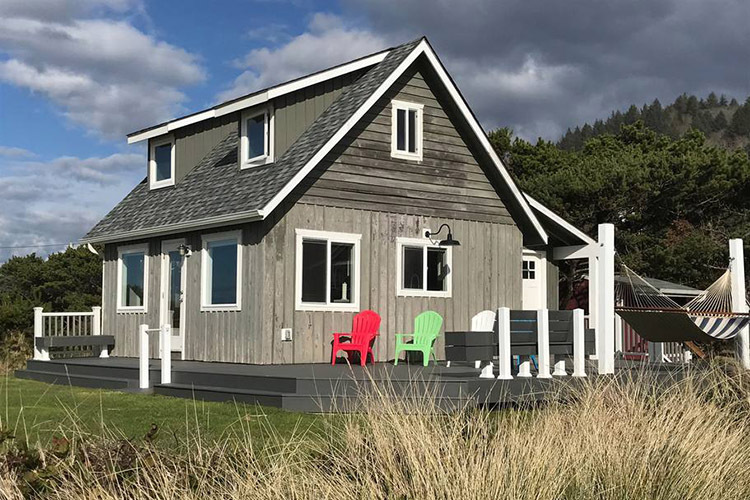 A charming pet-friendly cabin, the Olivia Beach Wind Sailor Cabin is just a short walk from the beach. On the outside, the cozy pastel cabin is surrounded by water and sky. Inside, the cabin is equally adorable. There are French doors to let in the ocean sunlight, there’s a cozy loft above the main room, and you’ll enjoy full access to a gourmet kitchen with instant hot water. Traveling with another couple? Check out the twin cabin next door with an in-law suite. You can rent the cabins together or separately, and each one sleeps 4-6 people. Both cabins come with a private Jacuzzi that you’ll relish on cool Oregon nights. There’s also a heated saline pool near the fire pits with an ocean view, plus a communal area with a playground and space for volleyball. The Loft of Riley is an expansive 1,812 square-foot house with three bedrooms that sleeps ten people. 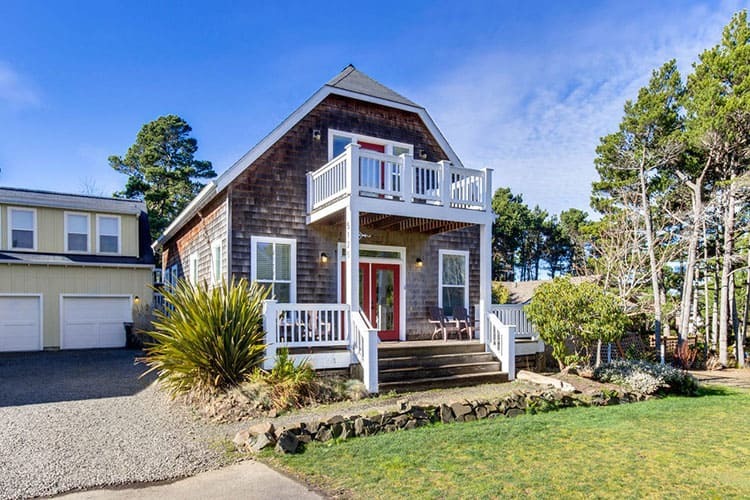 Located in Arch Cape, it’s a five minute drive to Cannon Beach and a ten minute drive to Manzanita. The house has backyard access to a peaceful beach filled with tide pools, so you don’t have to drive anywhere to enjoy the sand and surf. The inside of the house is absolutely stunning. There’s a narrow staircase that winds up the paneled wall and light fixtures that drip from the ceiling (though there’s rarely a need to turn them on with all the natural light in the house). In the kitchen, slanted white beams rest above the new appliances. This home is great for families and pets, though there’s an extra fee for your furry family members. As an added bonus, there’s also a Tesla charger so you can charge up for your daily adventures while you sleep. The Newport Oceanfront Cottage offers a priceless view of the ocean for a fairly inexpensive nightly cost. Rustic and simple, it’s minutes from the restaurants and attractions in Newport. Inside the cottage, you’ll enjoy free WiFi, cable TV, a wood stove, and a modern kitchen with new appliances. Outside, there’s a large deck with plenty of space to kick back and watch the sunset. 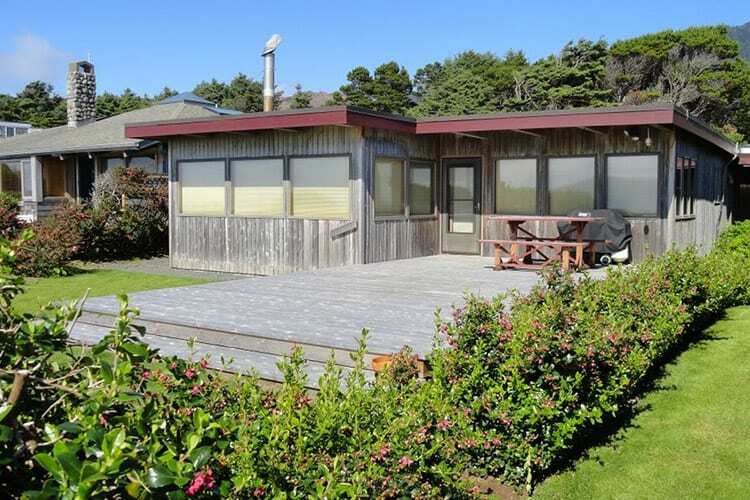 Note that bookings from June to September carry a four-night minimum stay, so this vacation rental is best for longer beach trips over the summer. Outside of peak season, it’s a great weekend spot for quick getaways. 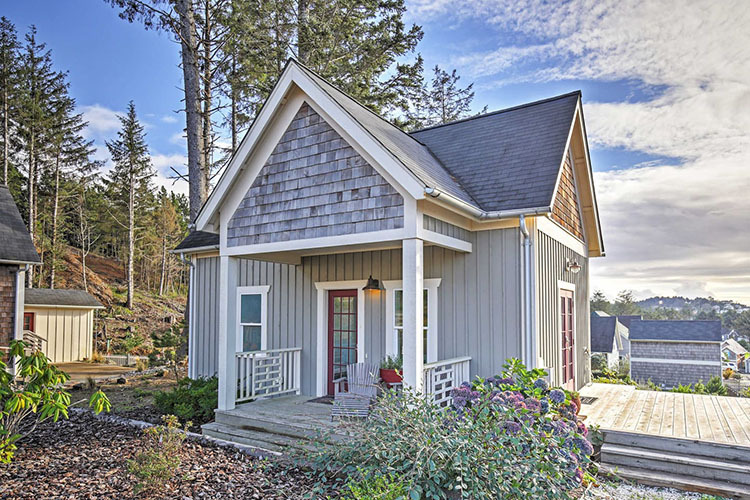 The Mountain Cabin at the Coast is a quaint little home in Manzanita surrounded by Sikta spruce trees. 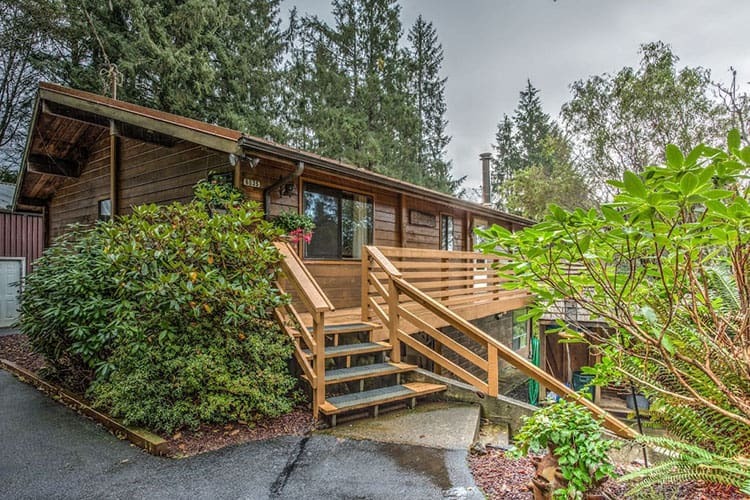 It’s an interesting combination, as the cabin definitely gives off mountain vibes even though you’re just a three-minute walk from the beach. Inside the cabin, the bright red armchairs, pillows, and rugs mixed with the cabin’s dark wood give the place a warm and cozy feel. There’s also a washer and dryer, foosball table, games, books, a turntable with vinyls, and plenty of cooking essentials. You won’t find a TV in this cabin, but there is free WiFi. If you run out of things to do inside, head out to the big deck to cook some steaks on the grill, enjoy a sandwich at the picnic table, or take a long afternoon nap on the hammock. 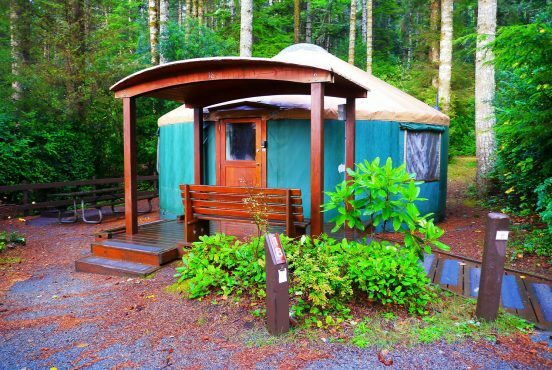 The price of this cabin fluctuates seasonally, so check the rates before you book. You may bring as many as six guests and two well-behaved dogs, though each dog requires a small additional fee. 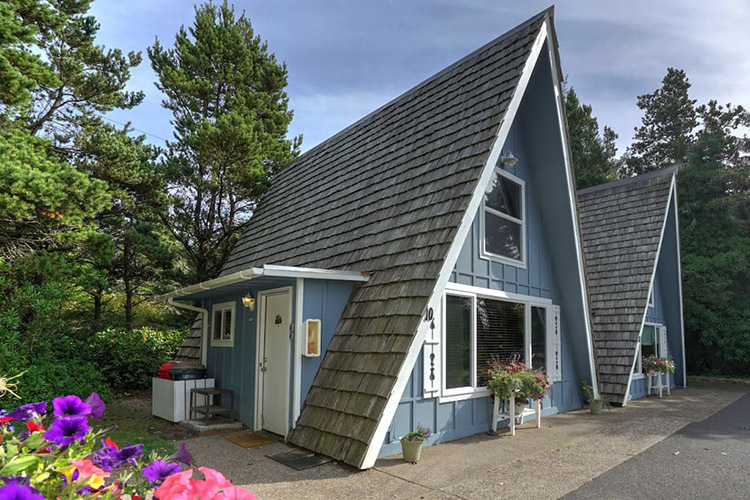 This unique A-frame cabin in the Alpine Chalet community at Otter Rock offers private ocean access for a very low nightly price. Outside, the Dude’s Abode is painted a pale blue with flower boxes at the windows. Inside, the interior has been restored to a 1969 vibe that’s perfect for surfers, free spirits, and fans of vintage A-Frame villages. At 656 square feet, the chalet can hold four guests with two bedrooms, three beds, and one bathroom. The main level has a kitchen, a living room that’s open to the loft, a bedroom, and an adjoining bathroom. Upstairs, you’ll find a loft with twin beds, a built-in desk, and a great view of the ocean. The seven-acre Alpine Chalet community has two fire pits, barbecue areas, a swing set, park benches, and easy access to the beach from just about anywhere. The Bluebird House is a charmingly rustic cabin set high above the trees. 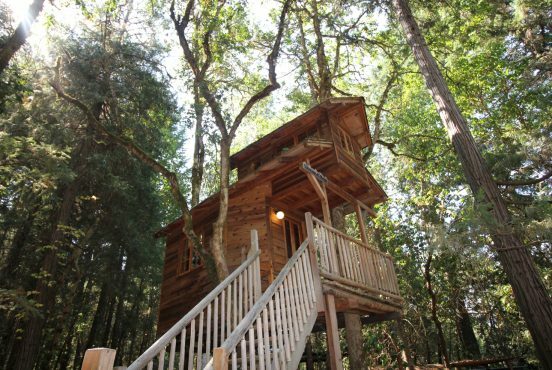 Located on the ocean-side of Highway 101 near the Cape Sebastian State Scenic Corridor, this treehouse is the perfect place to truly unplug with up to four guests. The treehouse has one bedroom, three beds (including a feather bed), and one bathroom. It’s great for birdwatching and storm watching. The owner also owns donkeys, and is happy to take guests on a hike with the donkeys for an additional fee. 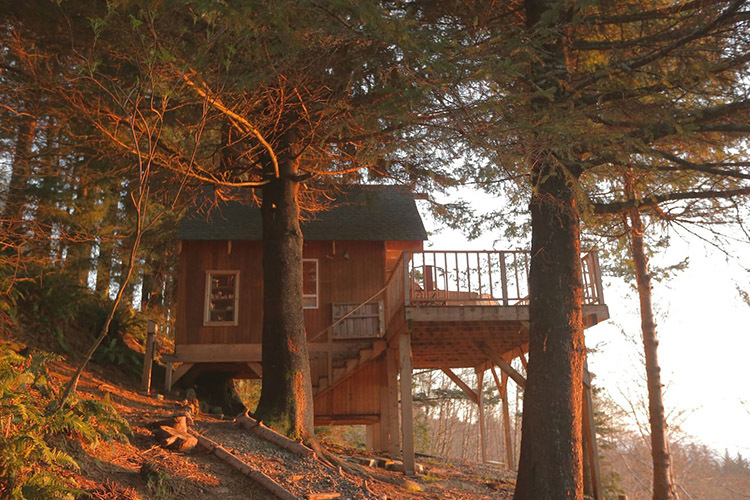 The Perch Cabin sits up in the trees above the beach in the quiet community of Oceanside. 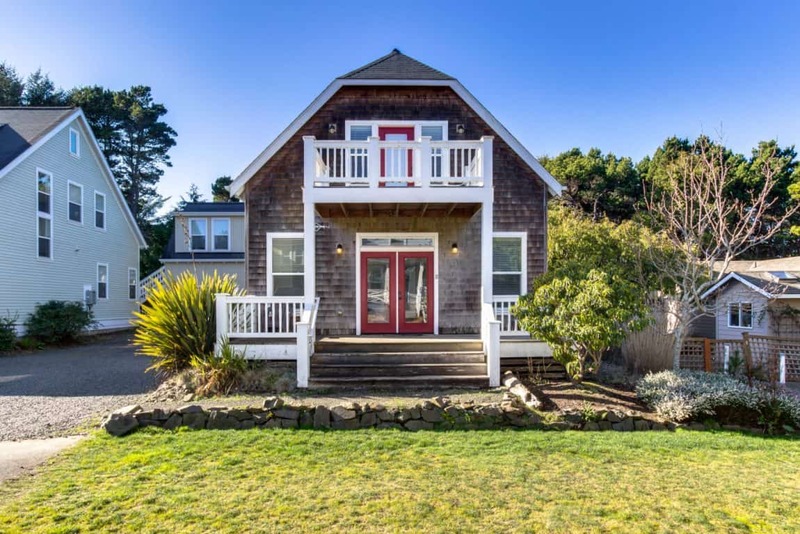 The newly remodeled home has space for four people and an enormous wraparound deck with wonderful ocean views. When the surf calls for you, the beach is just a 10 minute walk away. Inside the cabin, there’s a wood stove and a gorgeous custom-made shower with river rock flooring. The kitchen is fully stocked, and there’s a barbecue grill outside. 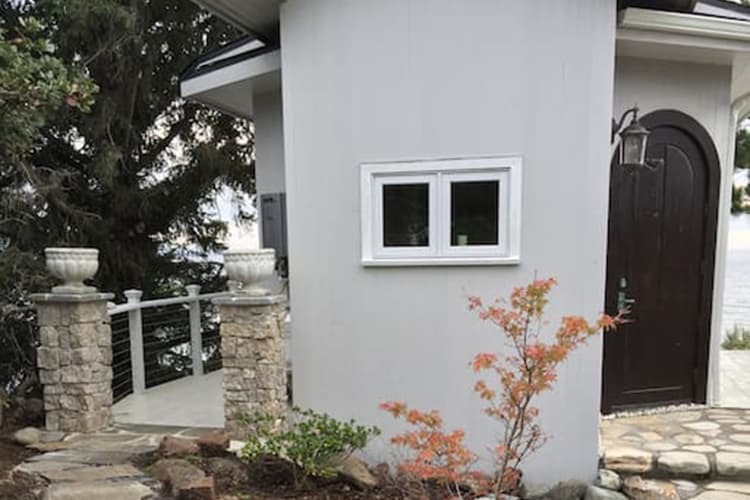 You’ll have to climb 26 stairs to reach the Perch Cabin and the walk to the beach isn’t exactly a stroll in the park, so this particular property isn’t ideal for handicapped, injured, or elderly guests. The Coastal Retreat on a Peninsula is a little one-bedroom home with just enough space for two guests. Decorated with a nautical theme, the guesthouse is perched on a cliff surrounded by blue waves, two coves, and majestic views of the ocean and the harbor. From your lofty perch you can watch the storms roll in, track the crab boats in the harbor, and spot some whales during migration season in the summer. There’s a charming stone path that leads down the peninsula to the guesthouse. Inside, the newly-built guesthouse is 350 square feet with heated floors in the bathroom and a subzero fridge in the kitchen. In the summer you can order breakfast to eat around the fire pit at the main house, and the resident astronomer will be happy to guide you through some evening stargazing. A Most Charming Space is a one-bedroom, two-guest apartment in the Drift community of Yachts. You’ll actually check in at the Drift Inn Restaurant, as the apartment is above the restaurant on the third floor. The stairs can be a pain, but being three floors up means you get better views of the ocean. The apartment is cozy and well-lit, with cathedral ceilings and a queen size bed. The kitchen is fully stocked and you have access to a patio. Although the apartment is right in the middle of town, it’s fairly quiet. There’s a little noise from the highway, but not much from the restaurant downstairs. Perhaps the greatest benefit to this location is the benefit of having a restaurant downstairs. You’re welcome to cook as much as you want in the apartment, but we won’t blame you if you opt for take-out every meal. The Montgomery Cabin was built in 1982 by the current owner’s great-aunt and great-uncle. The 2,000-square foot home sleeps six to eight people, has three bathrooms and three bedrooms, and was completely remodeled in 2013. The property itself is three-fourths of an acre, so there’s plenty of room to roam. You’ll enjoy an excellent view from the kitchen, original artwork on the walls, and a warm fire from the wood-burning stove. The master suite has a walk-in closet, and the family room has a flat screen TV with Hulu and Netflix. 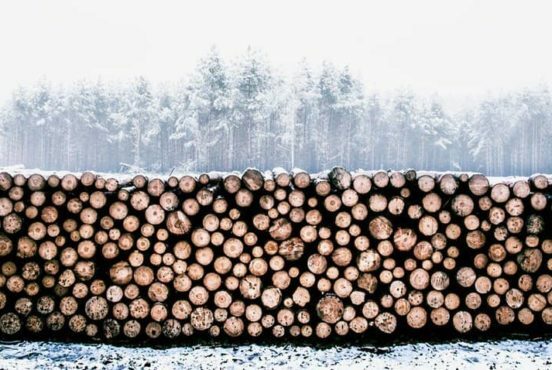 If you get cabin fever, the owners recommend hiking the old logging road behind the cabin, or making an afternoon trip to the Tillamook Cheese Factory. Feel free to bring your boat — there’s plenty of space to park it on the property. 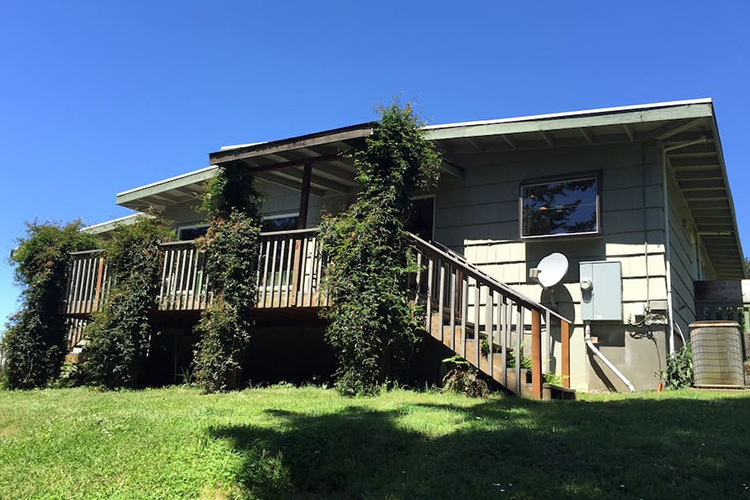 The inexpensive Oregon Coast Living vacation rental holds six guests in three bedrooms. The updated 1959 home is bright, airy, and dog-friendly with a fenced backyard. The home is located in a private, quiet neighborhood, so you’ll enjoy plenty of peace and quiet here. When storms roll in, cozy up next to the indoor fireplace with a good book as you listen to the wind and swells. Amenities for the property include air conditioning, cable TV, WiFi, washer, dryer, and a fully-stocked kitchen. This rental tends to fill up fast, so be sure to book well in advance. The Oceanfront Bungalow in Tierra Del Mar is just 30 feet from the beach. It’s ideal for four guests with two bedrooms and one bathroom, and there’s a larger house next door that’s available for joint bookings. The home has been completely renovated and has a dishwasher, washer, dryer, and modern furniture. You can see the beach from every room. There’s plenty of entertainment inside with DVDs and card games, or you can take advantage of the beach chairs, hammock, and gas BBQ on the private deck. 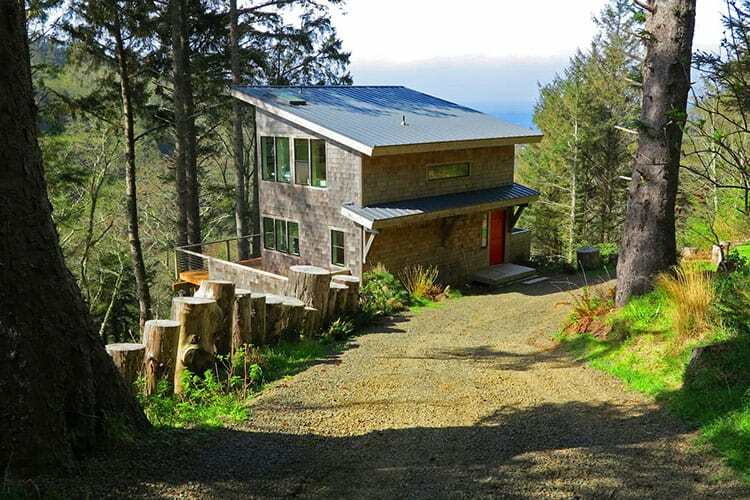 The Ocean Hideaway on the Oregon Coast is a bright, beautiful home that’s ideal for four people. The house has one bedroom with two beds, one bathroom, and a full-service kitchen. There’s free WiFi, cable, Roku, and a 42-inch TV for indoor entertainment on rainy days. The vacation rental sits a block off the beach, so the sand and surf are just moments away. Nearby Lincoln City is stacked with shopping, activities, and restaurants, so you shouldn’t have to worry about a dull moment around here. The Ocean Hideaway on the Oregon Coast is a pet-friendly property, though there’s a nightly fee for housing furry guests. The charming Green Flash Cabin is perched on the side of a hill overlooking the trees and the water, with a private deck that makes you feel like you’re on top of the world. This one-bedroom, one-bathroom home holds two people and offers fantastic 180-degree views. There’s a classic clawfoot tub, comfortable furniture, and new appliances. 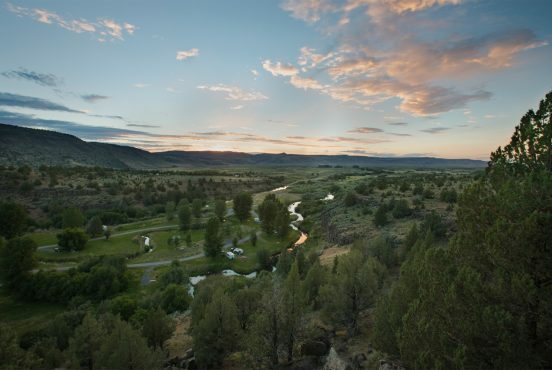 Sitting 500 feet above the valley, the Green Flash Cabin is quiet and peaceful. 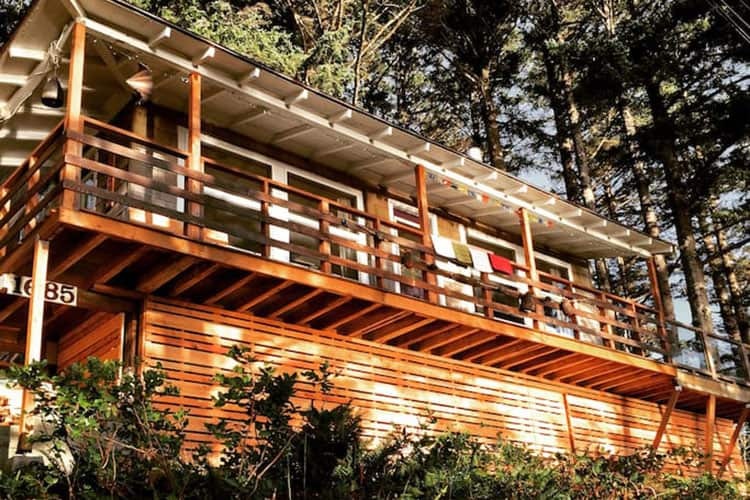 The cedar house was built in 2011 and has been featured in Sunset Magazine as one of the three best places to stay on the Oregon coast. 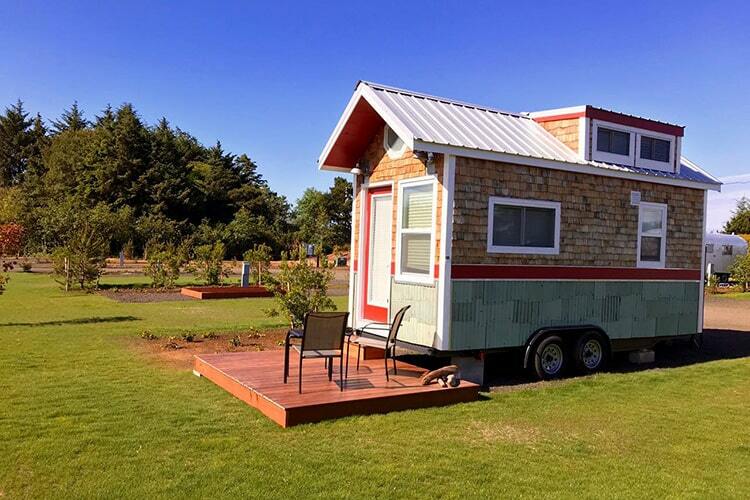 Have you been itching for a chance to spend a night in a tiny house? Check out the Driftwood in Tiny Tranquility — the first tiny home and vintage trailer park on the Oregon Coast. The Driftwood has a loft with a queen bed, a dining table made of reclaimed fir, and splashes of color with blue and yellow chairs, pillows, blankets, and bowls. True to its name, the tiny house features reclaimed wood and salvaged metal throughout. The Driftwood is just the right size for two guests and a furry friend. The mini-village of Tiny Tranquility has several amenities that guests can use, like a game and entertainment room, a grilling area, a greenhouse, and a dog park. 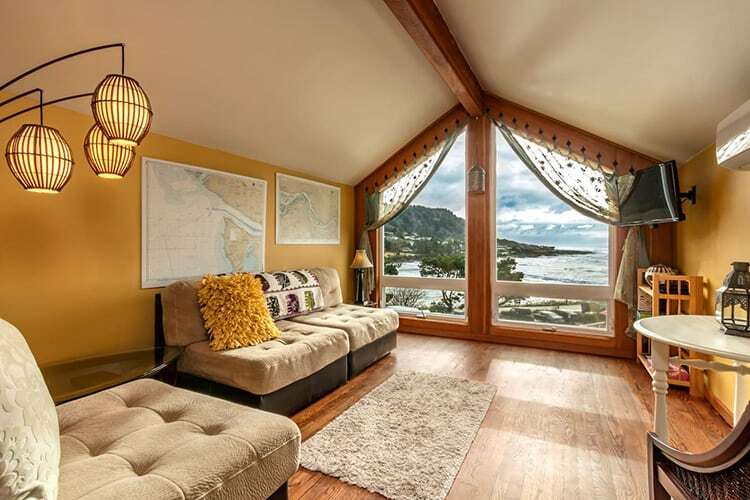 The Oregon Ocean Home in Manzanita is a little pricey, but the view from the living room windows is worth every penny. With the tall grass waving in the wind, waves cresting in the distance, and the blue sky stretching over it all, a weekend here will leave you with enough pictures to fill your Instagram for a month. At 4,400 square feet, it’s a gigantic cabin with capacity for 20 people in six bedrooms. The house is brand new (built in 2016), and every bedroom has an ocean view. The decor is impressively sophisticated and up-to-date, with stainless-steel appliances, a glass dining room table, and beautifully tiled bathtubs. There’s even a game room with foosball, basketball, shuffleboard, and arcade games. The great room has a 14-foot sliding door that you can open on nice days. When the weather takes a turn, retreat to the media room with a big screen TV, surround sound system, and leather recliners. Out back, you’ll find a seven-person hot tub and a fire pit with the ocean in the background. Located in Arch Cape, the Pilot House is a unique rectangular cabin with excellent ocean views. 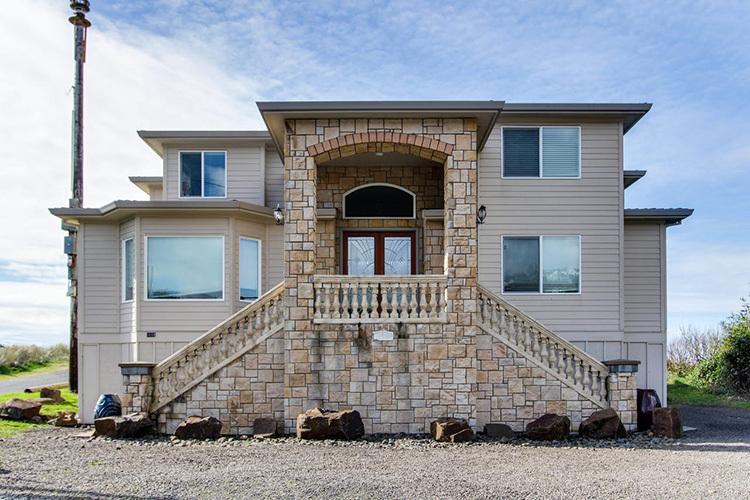 It sleeps eight people between three bedrooms and two bathrooms, and has a large living room and dining area to comfortably accommodate everyone. The beach is just a short walk away, and you’ve got plenty to keep you entertained on rainy days between the complimentary WiFi and the flat-screen TV with cable and a DVD player. The Pilot has a higher nightly rate than comparable options in the area, but it’s a solid pick if your options are limited. 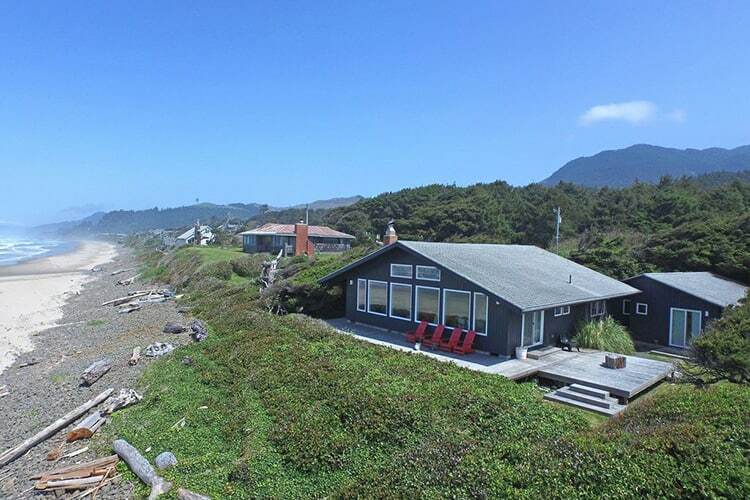 This Yachats Oregon Coast Oceanfront property can accommodate six people, and carries a minimum two-night stay. The one-level rambler is great for older couples or families with toddlers. Many rooms in the house have recently been remodeled. The wraparound deck offers amazing views of the ocean. When a storm rolls in, you can cozy up to the wood-burning fireplace in the living room and take in the view from inside. You won’t be able to hear any traffic here — just the waves crashing on the shore. 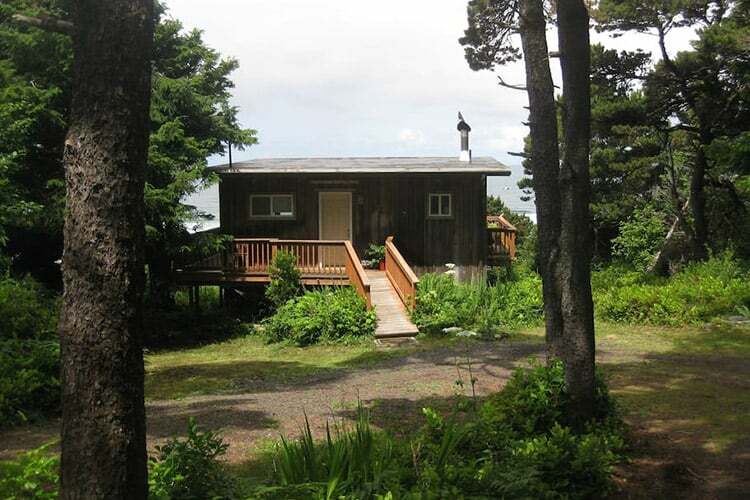 The cabin is about 25 steps from the ocean, so the beach is literally at your doorstep. There’s plenty of fun activities to do in Yachats, too — crabbing, whale watching, and golfing are all popular pastimes here. The Rockaway Beach Villa is right on Rockaway Beach. The interior of the cabin is spacious and modern, with enough room for 25 people between six bedrooms and three bathrooms. Given the size, this is a popular spot for family reunions and large family vacations. The master suite has a jetted bathtub, and there’s a foosball table for the kids (and competitive adults). Outside on the private deck, you’re just steps away from the sand. Should you ever get tired of the beach (we doubt you will), you’re just half a mile from restaurants and shopping. The Rockaway Beach Villa is dog-friendly, so you’re welcome to bring your pup along for the trip. There’s an extra nightly fee for pets, but it’s pretty reasonable. 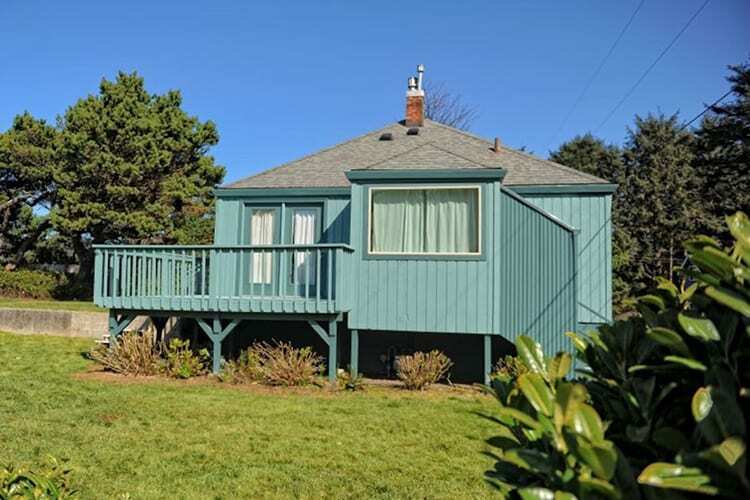 At the Seahorse Corral in Depoe Bay is a larger beach rental with three bedrooms, two bathrooms, and a loft. It can hold up to 10 people and a couple dogs (for an additional pet fee), though the owners recommend no more than seven guests to be comfortable. The house has a private hot tub, gas grill, and a fire pit for outdoor enjoyment. It’s a short walk to Bella Beach, an area that’s generally low-traffic and peaceful. 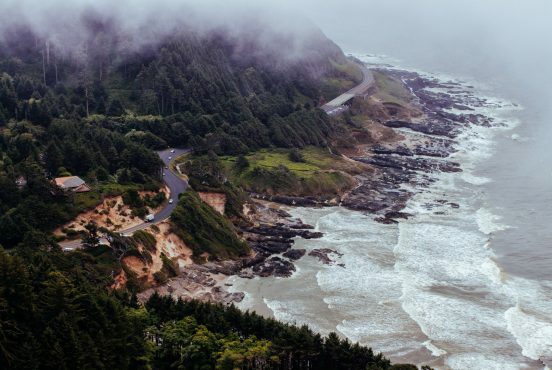 Nearby Depoe Bay and Lincoln City are quickly accessible via Highway 101 when you’re ready to hit the local shops and restaurants. You’ll find a porch and balcony on the front of the cabin. Inside, guests are provided with a full kitchen and their own washer and dryer. There are plenty of entertainment choices between the TV and free WiFi. 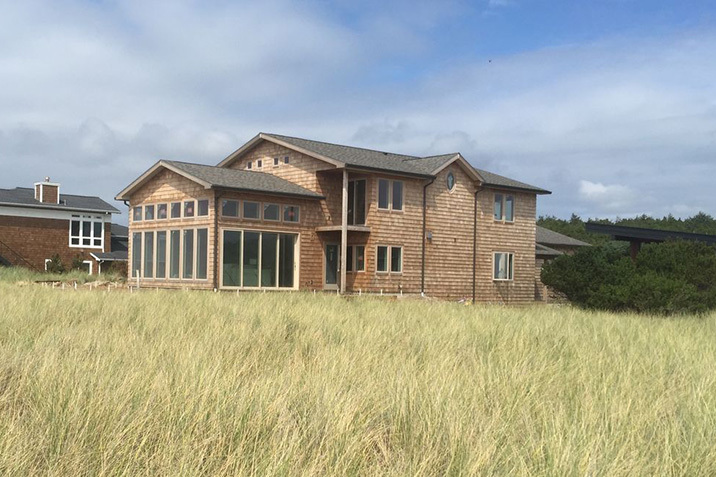 Still having trouble finding the perfect spot for your Oregon coast vacation? 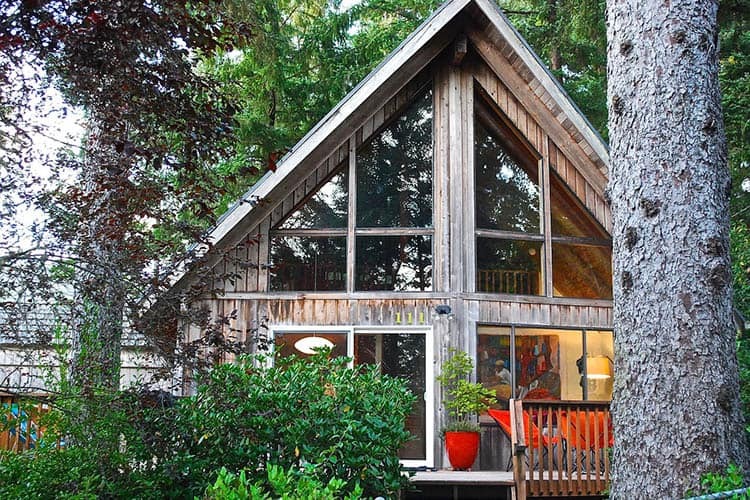 Check out our article on The Best Oregon Coast Cabin Rentals for a woodsy oceanside retreat. 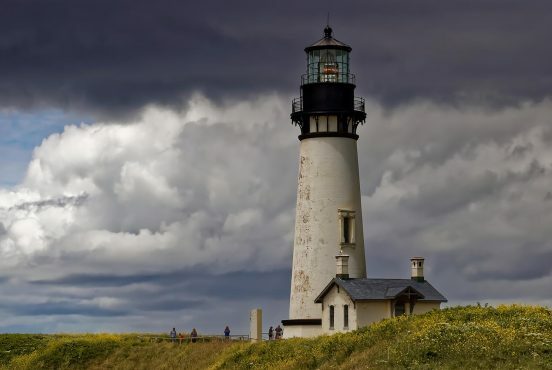 Looking for fun things to do on the Oregon coast? 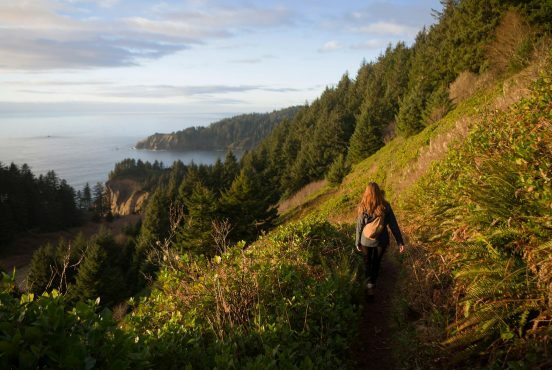 Consider exploring the Oregon Coast Trail, or pick a fun day hike from our list of the Top 25 Oregon Coast Hikes.